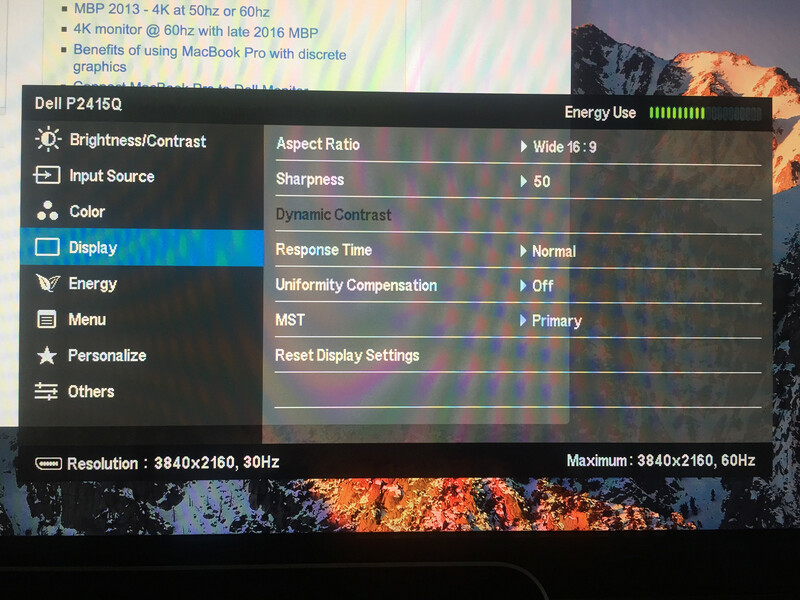 4K 60Hz over DP with Late 2013 Macbook Pro 15" + Dell P2415Q? I have a Late 2013 15" Macbook Pro with discrete graphics. According to this Apple support page: https://support.apple.com/en-us/HT206587 this model supports 4K 60Hz over MST. I just purchased a Dell P2415Q monitor, which supports DisplayPort 1.2, MST, and 4K 60Hz. I have the two connected by the included mini DisplayPort to DisplayPort cable. And the monitor is running at 30Hz. Everything I've read suggests that I should be able to get the monitor to run at 60Hz, but I can't find out how to. I'm trying to find answers among all the search results, but they're either outdated, different models, or asking about HDMI. Okay so I got 60hz working at 4K. Despite the fact that I swear I already tried this, the key was turning off MST. Unfortunately, I can't recall why I turned MST on in the first place. Did I create my own problem? I will say that I was unfamiliar with what Multi-Stream Transport was when I read the Apple support doc that I linked to in my question, and the doc was written in such a way to suggest that it was necessary for me to have on to get 60Hz on my MacBook Pro model. Not the answer you're looking for? Browse other questions tagged macbook display displayport 4k . Is there a difference between a 'mini-DisplayPort to HDMI cable' and a 'mini-DisplayPort to DisplayPort' cable for a MacBook Pro?